Roppe Rubber Wheeled Traffic Transitions provide a smooth, safe transition between carpet and tile in wheeled or rolling traffic installations. 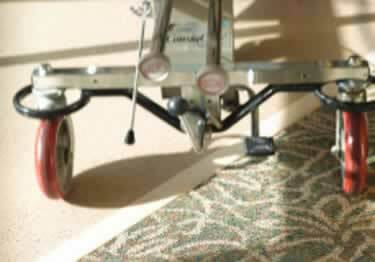 Create a safe, easy rolling transition from carpet to tile with these Rubber Wheeled Traffic Transitions by Roppe. ADA compliant and available in 30 different colors.